The Zamia furfuracea is the stump in the middle. This was taken during the winter after it had lost its leaves. Zamia don't usually lose their leaves completely like this one does, but this one always does. It will not put out new leaves until almost June, even though our summer begins as early as March. It's about 10 years old now. Kinda small because I've planted it in fairly heavy soil and I don't water it much (and its a slow-growing plant in any conditions). Zamia can take a light freeze and don't mind regular watering during the hot months. They like as much sun as you can give them. Ceropegia woodii is the blue-purple-grey vine with heart shaped leaves. Ceropegia just hates to be watered in the winter and will often just give up if you aren't careful. It likes half day to full sun with minimal water and food. Ceropegia woodii has unusual lantern shaped flowers in the spring and summer that will produce lots of viable seeds that grow easily. 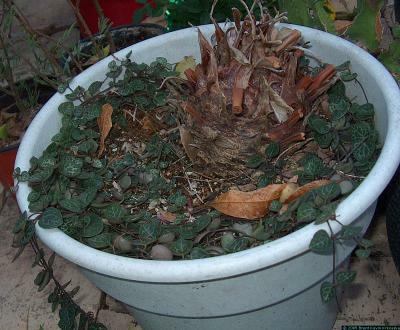 The stem produces tiny potato-like growths that will root in the soil, or just be small lumps in a hanging basket.